An American in Paris bursts into life on the West End stage for the first time when the multi award winning new Broadway musical comes to London’s Dominion Theatre next spring. Inspired by the Oscar® winning film and featuring the timeless music and lyrics of George Gershwin and Ira Gershwin with book by Craig Lucas, An American in Paris has preview performances from Saturday 4 March 2017 with the official opening night on Tuesday 21 March 2017. It is directed and choreographed by the Tony® award winning Christopher Wheeldon with set and costumes designs by Bob Crowley; lighting by Natasha Katz; sound by Jon Weston and projection designs by 59 Productions. The musical score is adapted, arranged and supervised by Rob Fisher with orchestrations by Christopher Austin; dance arrangements by Sam Davis; musical supervision by Todd Ellison; additional orchestrations by Don Sebesky and Bill Elliott and musical direction by Nigel Lilley. 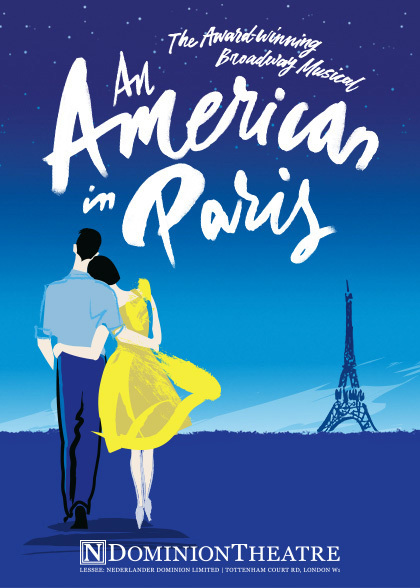 An American in Paris features many of George and Ira Gershwin’s most iconic songs including I Got Rhythm, ‘S Wonderful, and They Can’t Take That Away From Me, together with George Gershwin’s sweeping compositions including Concerto in F and An American in Paris. Fresh from originating their roles on Broadway, Robert Fairchild (a New York City Ballet Principal dancer) will play Jerry Mulligan and British Royal Ballet dancer Leanne Cope will play Lise Dassin. These acclaimed, award-winning stars, who will be making their West End debuts, will lead a company of over 50 actors, dancers and musicians. Further West End casting to be announced. An American in Paris is produced in London by Stuart Oken, Van Kaplan, Roy Furman, Michael McCabe and Joshua Andrews.